This month has been Breast Cancer Awareness month and there have been a lot of pink manicures floating around. I think it would be a bit depressing for me to highlight the statistics of the amount of women, families, friends etc who have been affected by cancer so I won't. Models Own 'Hot Stuff' over Sinful Colors 'Beautiful Girl'. I created the ribbon out of acrylic paint. My camera just did not want to capture the beauty of this pink polish, or my ribbon. Meh. I received this Japonesque Manicure Set a while back but didn't get around to posting about it. It's such a beautiful pearl pink and a portion of the sale price will be donated to Breast Cancer Research. All the tools you'll need for a good manicure...you just need this and a tube of cuticle oil! I love this Japonesque kit because it's perfect for home use (my husband loves the cuticle nippers) and it's suave enough to take on set too. I won't be taking this to any set though. When I worked at London Fashion Week, someone nicked my acetone pump bottle! I do have some more Japonesque goodies to show you, so please bear with me. Same formula - clear jelly with gold, orange and green glitters. The glitter is a lot more vibrant in real life. My camera seems to be on it's way out...it's not as good as it used to be *sigh*. I was actually in the processes of thinning my detail brush and thought I'd test out the thickness. It's still not thin enough yet though. I need a brush that has about three hairs in it, so I'm back to clipping this one. If you partake in the Halloween festivities over the weekend, enjoy! Models Own - Freak Out! Here are some pretties that I picked up on the weekend. Here are only three of the five glitters in the Mirror Ball collection - these were my favourite. L-R: Disco Inferno, Hot Stuff and Freak Out all from the Mirror Ball collection. This is three, count 'em, three layers of polish over a pale blue . The glitter, hex's, strips and mylar shreds are suspended in a clear polish. I only put one layer of Seche Vite on, so some of the mylar (at least that's what I think it is), was sticking up. I do like this polish, but I wish I could wear it just on it's own and have full coverage. Welp, I have two more polishes to try so I'll see what I can do! Every time I look at my picture folders, I find pictures that I haven't posted! Here's one I totally forgot about (after wearing it for one day). Barry M's Burgandy Croc over pink. My thumbnail is actually an acrylic sculpt. 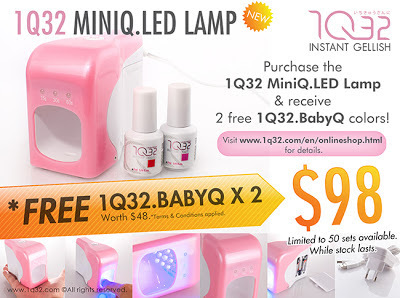 This is just a short post to let you know that 1Q32 are running a promotion on their MiniQ.LED lamps - if you buy one, you'll get two free 1Q32.BabyQ colours. Just quote my blog URL if you do make a purchase. There's not often a day where I don't have something nail related on my mind. Unfortunately, I seem to be painting my own nails less often and that's usually because I'm prioritising other things. Right now, I should be folding washed clothes. You'd laugh if you could see how precariously my laptop is currently balanced on a stack of baby vests. Last night I created these nails. I've been saying that I have intentions of opening an Etsy shop to sell some of the nail sets that I've been making, but I have yet to actually get five minutes to do so. So far, I've been painting them and putting them in a drawer! Here are my Rhino nails. I had some studs and the very gorgeous Black Out by Rimmel (60 Second range), so I just had to play around with them. This is only one half of the set. My sets consist of 24 nails - one fish bone for the left hand and one for the right. This way, you will find a nail that fits you, without having to file the sides too much. These were also going to go into the drawer, but they've already found a home. I suppose these should be sold with a disclaimer...I don't want to get sued for any soft tissue damage! Viva La Nails Halloween Nail Art Contest! 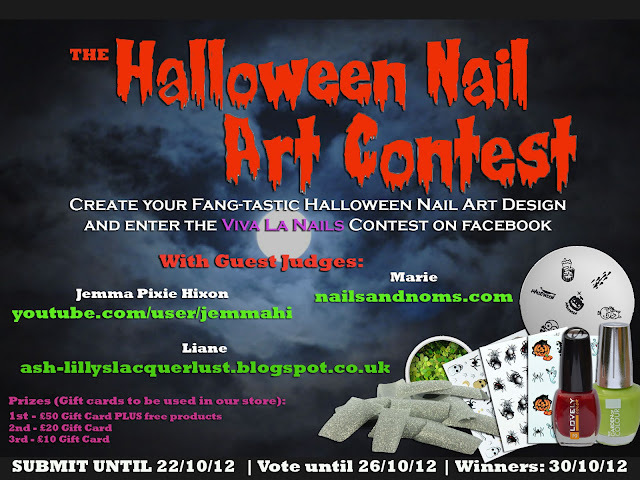 I'm back again to tell you about a Halloween Nail Art Contest being run by Viva La Nails! Yes, I'm one of the judges, so put your spooking cap on and get polishing! 3. Name as Viva La Nails Halloween Nail Art Contest and tag "Viva La Nails"
4. Get as many friends and family to vote for you! To VOTE for your favourite, click the "like" button under the photo. 5 photos with the most votes will be showed to the Judges. Judges will then decide on the THREE winnners. 1Q32 Instant Gellish, yay or nay? You know that I'm a die-hard nail polish fan and that my first ever experience with gel nail polish was a bit of disappointment (because of the application and not the product itself). Well, I'm happy to say that I have found a gel polish that has actually made me pretty happy. This is 1Q32.BabyQ 'Instant Gellish'*. I think this may be QB45 - that's the number on the bottom of the bottle. You can see that I cut the stilletto down to a manageable length. It was a bit of a shame, but I couldn't type properly. The enclosed paperwork stated that 1Q32 was a one step gel polish that did not need you to buff the nail, use a primer or apply a base coat before application. Further to this, it was supposed to be hard wearing, scratch proof, long lasting and did not have a sticky layer after curing under a UV/LED lamp. This product was supposed to be as easy as applying normal nail polish and extremely easy to remove. I am a sceptic...so of course I had to try it out. I started with clean nails with the cuticles pushed back. I used an acetone soaked cotton pad to remove any oils and debris and then applied one layer of the polish. I cured the nails for two minutes under a 36w UV lamp, applied a second coat and then cured it for the same amount of time. Had I been the owner of an LED lamp, the curing time would have been about 20-30 seconds. After application I used a DRY cotton pad to shine the nail - there was no sticky layer to remove. That was it - no topcoat was necessary although I was supplied with one. I was actually impressed about the ease of the application. Only one bottle was necessary (this means you can keep costs down with no need to purchase primers, cleansers or top coats) and this was something that I could do very quickly. After doing manicures on models for an editorial photo session I was working on two days later, I noticed that I had filed the surface of my thumb and index fingers so badly that they no longer shined. The other nails were perfect, but I wanted a new colour so I decided to remove the polish. I soaked my nails in acetone for less than ten minutes (using those wearable thimble things that you can put acetone in) and this is how they came out. I didn't have to scrape anything, I actually just pushed the lifted polish right off my nail. Now that I find myself busier undertaking manicure work, my regular nail polish manicures don't last anymore. I didn't want to wear other gel polishes that took longer to apply or to remove, so personally I was really happy with this...other than the red staining that was left behind. I had to use a buffing block to get rid of it. The website has a wide variety of colours, including my favourites - glitter! As nail polish hoarder, I generally shun gel polish, but more recently it has become a necessity. I'd definitely wear this brand again because, for me, the ease of application and removal is a big selling point. To combat the staining (which could be because of the lack of base coat), I suppose you could use the top coat as a base. If you do visit the website, keep an eye out for the special offer - two BabyQ polishes with the purchase of a mini-UV lamp which cures one finger at a time. Have you heard of or tried this brand? If so, how did you find it? * This product was sent to me for review. Olympia Beauty and my stilletto nail. At the end of September I attended the Olympia Beauty exhibition in Kensington London. This exhibition is extremely popular within the beauty trade and includes beauty seminars, industry speakers, the Nailympics (competition) and the Art of Make Up (also a competition). There were also lots of stalls retailing all sorts of beauty supplies and equipment at trade prices. I was able to buy Nubar and Color Club polishes for about £2-3! On my way out of Olympia that day, I spied Gemma Lambert doing stilletto demonstrations. I'm a big fan of Gemma's and to see her work was a real treat for me. She even gave me a demo nail! Highly impractical with my office job, I know, so I wore it at this length for two days and then cut it down to where the bow ended. Olympia Beauty will be happening again on 22nd and 23rd of September 2013 and you can register for free tickets. As there is still another event to go in Dublin, you can't register for 2013 just yet. This is something that you will not want to miss, so keep an eye out for it. In a bid to continue catching up on all of the manicures I've worn over the last few weeks, here is something I did to Nails Inc's 'Baker Street'. This is Baker Street before I brought out the acrylic paints. Unfortunately, these pictures do not reflect the true colour of this polish. In actual fact, it's slightly darker. This is OPI's 'RapiDry'; I bought this from a beauty supply store because I'd run out of Seche Vite. I actually bought two bottles...and I don't like it. In comparison to Seche, it doesn't dry as fast and it isn't a glossy. I'm now stuck with two bottles of this stuff! That's it for today - I have a few more mani's to post and then I'll be up to date! In recognition of the fact that it's 'Stop-tober', a time where those who smoke cigarettes stop for the entire month of October, today I'm going to tell you about a product that was sent to me recently. 'The Vapestick, is a non-flammable, electronic atomising device that uses advanced microelectronic and physical atomised technology'. Phew! Basically, this device is an electronic cigarette that has cartridges that contain diluted nicotine (or, non-nicotine alternatives such as apple liquid). It's charged with a USB cable, comes with spare vapour cartridges, a carry-case and a handy little disclaimer card to help you explain that the device is not a lit cigarette. I'm not really a smoker so I asked someone else to try the nicotine cartridge. I, on the other hand, tried the apple flavoured cartridge. As I pressed down on the button in the middle of the device and inhaled, it filled my lungs with a light apple vapour. I was also able to exhale a small, non-offensive cloud of vapour. For a person who wants to stop smoking but doesn't want to chew gum or use patches, this might be a good alternative. Speaking from a non-scientific background, I can imagine that this device might provide some comfort to those smokers who may miss holding a cigarette or that hand-to-mouth action. The non-nicotine vapour cartridges would also be good for those who are now nicotine free. If you want to find out more, visit Vapestick. If you are trying to give up smoking for this month, or for the rest of your life....GOOD LUCK!